Blender already supports 3D printing modeling and file-formats since 2002. With the latestBlender version (2.67) this now is even more accessible and powerful with the new 3D PrintingToolbox and real-time Mesh Analysis features.This Training DVD is for everyone who is into 3D printing, beginners and professionals alike. There are extensive chapters introducing Blender modeling for new users. It then handles alltopics you need to know for efficient and good quality 3D prints, including color, wallthickness or overhang problems. You will also find printable models to experiment withyourself.Whether you own your own 3D printer, or use online services such as ShapeWays, this 3+ hourstraining DVD will help you joining this exciting new Maker era! Dolf Veenvliet is a Dutch artist who has been exploring 3D printing for sculpture design formany years. He is an enthusiast user of Blender, owns a MakerBot printer, and a big fan ofanything open and sharing. On his website macouno.com you can find many examples of his work. 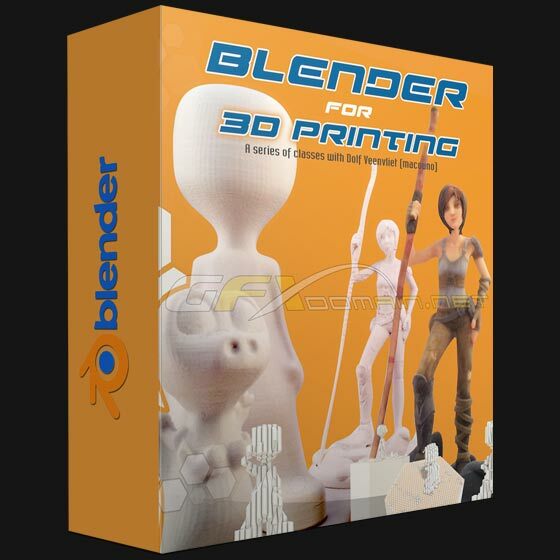 This DVD has been produced by Blender Foundation. All contents and video is available for youas Creative Commons Attributions.